Self-priming pumps with single impeller. The pump body is made of stainless steel AISI 316, the impeller is available in different types of flexible rubber (Nitrile, Neoprene, EPDM, natural rubber or silicon) depending on the liquids to be pumped. All the models are supplied with a switch reverser for flow inversion. The pumps are supplied with a low number of turns per minute motor to pump alimentary liquids without alterations. At request are available a wide range of different connections (see options). At request bigger models are available. These models are suitable for a soft decanting of delicate or viscous fluids also containing solid parts. they are commonly used to pump oil, fruit pulp or juice, honey, syrup, yoghurt, beer, toothpast, detergents and many other fluids.The low turns per minute and the flexible wings of the impeller permit to pump alimentary liquids without altering the organolectic characteristics. 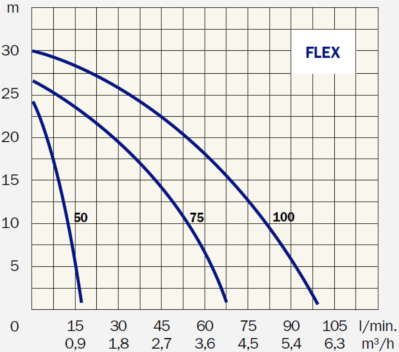 * Attention: The curves indicates are referred to the impeller in NBR at 20°C. Varying the material of the impeller and the temperature of the fluid pumped the performnce cna increase also of a 20%. The following connections are available: DIN, BSP-M, Triclover, SMS and BSM; Garolla,BSP-F, Macon and Friederich only for FLEX 75 and FLEX 100.